Photographed yesterday in the Alberta Rockies. Nikon D4, 200-400VR (Version 1) @330mm, iso 400, f5.6, 1/1000. Cropped to 16:9. The wind was howling and I was prone handholding my lens/camera. Excellent image showing these impressive males in their snowy environment. A fine composition making use of the different elements to balance this lovely image, Gary! 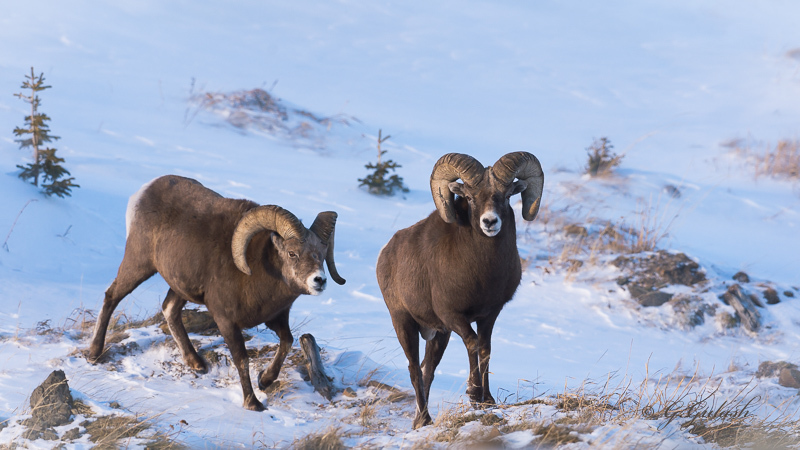 Well worth a click to appreciate the detail, and nicely done to catch the two complementary poses of these bighorn rams in the sweet light and their snowy habitat. Well done! Congrats on the pick Gary, great image!